There's a method to this madness and, it usually involves research. Today, I'll show you just this one black and white, framed picture found in a museum. Of course, before snapping the shutter, permission was granted. What you are looking at is a ritual conducted in the far north of Okinawa island. This month, hopefully, a few of us foreigners, will be attending the event. This photo helps me get the conversations going, trying to learn the details of what takes place. Documenting stuff like this, at least five questions have to be asked. That would be the Who, What, Where, When and Why, all writers have to know about. The first four, I pretty much have the answers, figured out. 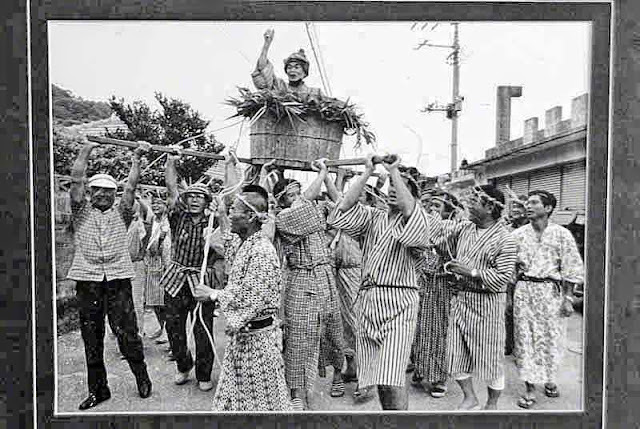 It's a bunch of guys wearing traditional clothing, carrying a wooden tub. And, it happens on a certain month of the lunar calendar. Why, is the part, I haven't got the answers to, yet. Do you suppose, they might have another bunch of folks, coming with another wooden tub ? Like, a crowd of women, carrying a gal, to meet the guy in this wooden tub ? What would a guy have to do, to get to ride in the tub from this part of town ? Anyway, the research goes on.